“Bingo!” That was the reaction of the man who found the largest gold nugget within the British Isles for centuries. As far as winning a game of chance goes, this one is particularly big and very few games of Bingo would inspire such interest from historians, geologists or gold experts as this one. When gold is found it usually creates a scenario in the reader’s head of bearded men with tin pans and sore backs. Or perhaps you might imagine a walker stumbling along a riverside when something glistening caught their eye? Neither are true in this case. 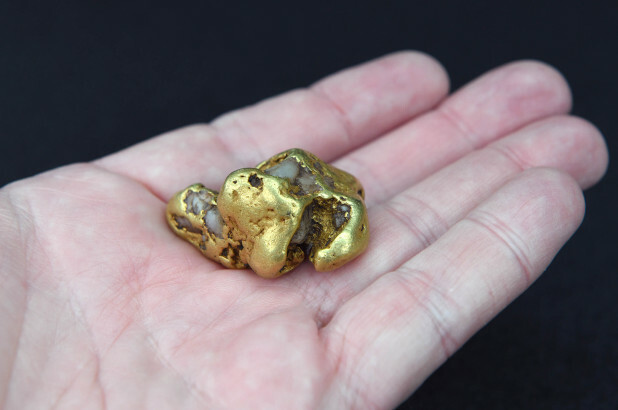 The largest gold nugget found on British shores required the man to don a dry suit (which are different to a wetsuit in that they repel all water from the body instead of keeping the diver warm while wet). Add a snorkel, goggles and a keen eye and you have the practice of “sniping”. The man, who wishes to remain anonymous, was sniping with a friend when he came across the nugget, but didn’t realise just how large it was. “I took off my glove and picked it up,” he told interviewers. It took a few moments, but when he realised what he was holding he shouted “Bingo!” The man is unsure about what it is he wants to do with the nugget, but it is reported that the find took place more than two years ago. The man has been looking for gold as a hobby for more than 20 years, but, unsurprisingly, he says he has “ … never seen anything like this in my lifetime”. He and his friend are said to be of the view that the exact location of the find should be kept secret to protect the river from being ruined by gold hunters. Is There More Gold To Be Found? Wanlockhead in Dumfries and Galloway has been described as “the Mecca for gold panning” by experts in the field, but it is unclear if the find was part of a larger nugget. Author of the book Scottish Gold: Fruit of the Nation, Dr Neil Clark has says the nugget’s rounded edges suggest it has been in the water for some time, but due to its size, it has likely not travelled far. The area is no stranger to major gold discoveries. In 2010, a nugget weighing just under 20g was found in Wanlockhead and is thought to be worth £10,000. This is alongside smaller deposits, such as those that led the anonymous gold hunter to the record breaking nugget two years ago. The nugget weighs 85.7g (2.75 Troy ounces), which makes it the largest nugget discovered in the British Isles for more than 500 years. The gold content alone makes the nugget worth around £50,000, but due to its uniqueness and the historical nature of the find, it could be worth significantly more to some collectors. Although it is the largest find of its kind in centuries, other discoveries in recent years have eclipsed it in regards to weight. In 2012, just off the coast of Anglesey, a nugget weighing 97g was discovered, but this was thought to come from a shipwreck in 1859. Britain does have a history of large gold nugget discoveries within the last few centuries, such as the 59g nugget found in Cornwall at the beginning of the 9th century, but nothing of this scale has occurred in the region since the 16th century. What Next For The Nugget? The nugget is currently being kept in a safety deposit box while its future is negotiated, but it is likely it will be sold. The hope of many is it will be purchased by a museum and displayed for the public, but, due to the how exceptional the find is, a collector with deep pockets might well be tempted to pay way beyond the value of the nugget’s gold content.